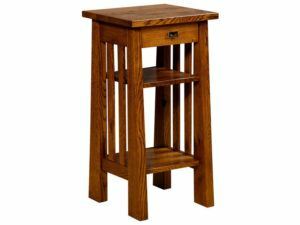 You’re most likely looking at telephone stands because you still have a land line. And at Brandenberry, we haven’t forgotten you. So we’re offering an impressive collection of telephone stands. 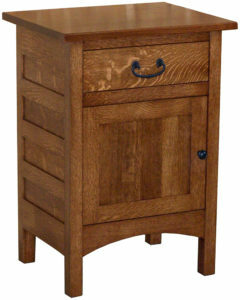 They’re all Amish-built for great looks plus superior strength and durability. 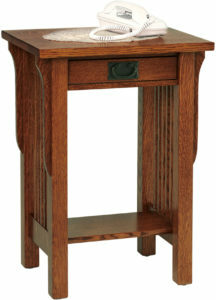 The Craftsman Mission Collection Telephone Stand makes a beautiful accent to your home. You have a drawer or two fixed shelves to utilize for dynamic storage with the Freemont Open Mission Phone Stand. 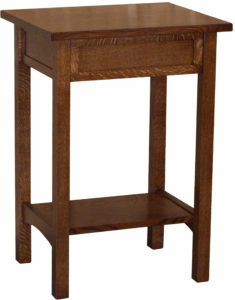 Shown in Rustic Quartersawn Oak with FC9018 Finish. Here’s a great selection of telephone stands for wherever in your home you wish to park your land line phone. 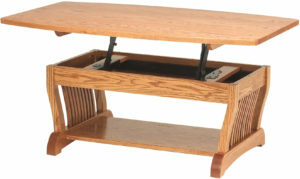 Notice that the collection includes nesting tables, any of which you could use as a modern phone table. So why should you choose a phone table stand from Brandenberry? Here are three top reasons. First, skilled Amish artisans custom-build each unit. And they use solid hardwoods. Like maple, cherry, oak and hickory. Which means that with proper care, the phone table you choose should help you make and take calls for a long time to come. Second, you get to select from a variety of designs. As a result, you can choose the piece that blends right in with your décor. Thirdly, you can customize your table of choice to your liking. For example, you can select the wood specie and finish. Plus other special features like finish size, drawers and the like.